PT Krakatau Steel (Persero) Tbk - PTKS or referred to as "Krakatau Steel Group" is a reputable state-owned steel makers in Indonesia. Krakatau Steel Group is majority owned by the Government of Indonesia. Currently, the Government of Indonesia holds 80% shares in Krakatau Steel Group (IDX:KRAS, listed since 2010). Other 20% remaining shares was owned by public. Based in Cilegon Banten, Krakatau Steel Group running business in integrated steel industry and operates primarily as a producer of steel products. Its produces include Hot Rolled Coil/Plate, Cold Rolled Coil/Sheet, and Wire Rod. 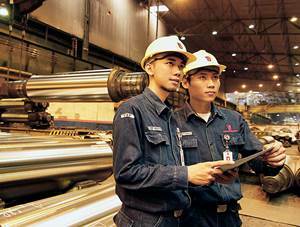 Krakatau Steel Group also engaged in trading activities, services, and other supporting activities. Krakatau Steel Group now has 6 production plants with installed total production capacity of 3.15 million tons per year. Krakatau Steel Group also supported by 11 key subsidiaries and 15 affiliated companies. In term of financial performance, Krakatau Steel Group booked positive growth in 2016. According to information found in PT Krakatau Steel (Persero) Tbk Annual Report 2016 as cited by JobsCDC.com, Krakatau Steel Group reported total steel sales volume of 2.24 million tons in 2016. This total sales number is up 15.46% (yoy) from 1.94 million tons in the previous year. Referring to its annual report, Krakatau Steel Group booked total operating income of USD4.39 million in 2016 or experienced significant improvements from the previous operating loss of USD183.55 million. Maximum age of 35 years old on 31 August 2018. Bachelor Degree with minimum GPA of 2.75. Required experience for minimum 2 years in related field. Fluent in English, both oral and written (as mandatory requirement). Preferably fluent in several foreign language (Mandarin, Korean, Japanese). Preferably experienced in corporate communication field and media. Maximum age of 30 years old on 31 August 2018. Preferably experienced in sales and marketing field of automotive industry/construction/Pipe and Tube/Boiler Pressure Vessel/Government and private project and other manufacture. Required experience for minimum 4 years in related field. Preferably experienced in market intellegence field (steel product) or steel product marketing specialize in project and construction. JobsCDC.com now available on android device. Download now on Google Play here. Please be aware of recruitment fraud. The entire stage of this selection process is free of charge. PT Krakatau Steel (Persero) Tbk - Staff, Junior Manager Krakatau Steel Group August 2018 will never ask for fees or upfront payments for any purposes during the recruitment process such as transportation and accommodation.